> Who’s Got My License? After the license pool has been exhausted and end users are denied from checking out further licenses, they would receive license availability notifications when these licenses have been made available again (see below). This option is enabled by checking the EasyAdmin Start → Administration → Agent Policy”Available license notification” box..
4. Automatically shut down in a predefined time by checking the EasyAdmin Start → Administration → “Active Agent” → ”Extension dedicated” → ”Actively shut open applications down at” box. 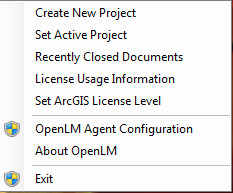 At most cases, the OpenLM Agent would be silently distributed among all workstations (3023)of a network. 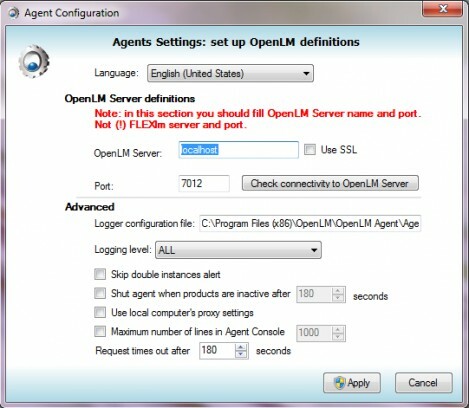 The OpenLM Agent Configuration form is designed to manually set and test the connection of a single workstation to the OpenLM server. “Use SSL” : use this option to use secure communication between the OpenLM Agent and the OpenLM Server. This process requires acquiring an SSL certificate, and should be performed by a system administrator. For more information – please consult this document[a].